Select the text you wish to copy by clicking and dragging your mouse over the text. Press Control (Windows and Linux OSs) or Command (Mac OS) + C to copy the text. Alternatively, you can right-click your mouse and select Copy from the pop-up menu. Or, you can click on the Wrench icon and select Copy in the Edit section. Go to the tab, window, or program where you'd like to paste the text, and press Control (Windows and Linux OSs) or Command (Mac OS) + V to paste the text. 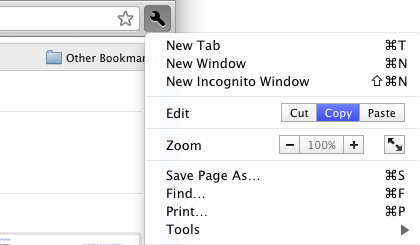 Alternatively, you can right-click your mouse and select Paste from the pop-up menu. If you're pasting the text in a Chromium tab or window, you can also click on the Wrench icon and select Paste in the Edit section.